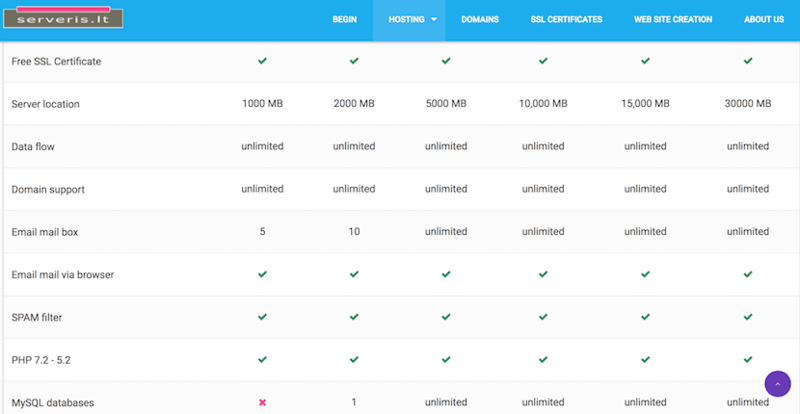 Serveris Review 2019: Is Serveris a Good Hosting? Lithuanian web host, Serveris, provides shared and VPS hosting from its Lithuanian data center. Many of its plans include unlimited data, and its website is primarily in Lithuanian. Started in 2002, Lithuania-based Serveris, provides hosting, website development, SSL, and domain registration services. cPanel is employed for hosting plans and a 14-day money-back guarantee is offered as well. Its servers are located in Lithuania, and its website is mostly in Lithuanian, with some information available in 27 different languages. For customers needing a virtual private server plan, Serveris offers four levels of VPS hosting. The VPS1+ plan includes: one 2GHz CPU, 2GB of RAM, 100GB storage, 100Mbps bandwidth, unlimited data traffic, and one IP address. VPS plans have the option of adding a DirectAdmin control panel license for an additional fee. More than six operating systems are available to choose from for VPS plans. 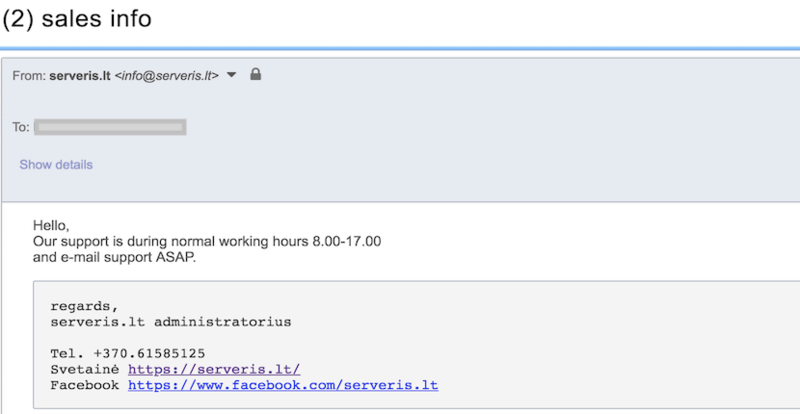 The primary language of the Serveris website is Lithuanian. From within the customer area, there is the option to choose between 27 different languages, however this only changes the menu text and not the content language. Pricing for Serveris’ shared hosting plans is affordable and in line with competitors’ pricing. The P1 plan costs around the price of a fast food kid’s meal per month and includes unlimited traffic, domains, mailboxes, and databases. Along with the free SSL certificate, this plan offers a very appealing value. Add in the discounts mentioned below, and the value increases to an even higher degree. For an even cheaper plan, the Start1 option is incredibly affordable, although it doesn’t include any databases. This may be adequate for a simple static website. Compared to other high-ranking Lithuanian web hosts, Serveris’ prices for are 50%-70% less. Shared plans come in one-month, three-month, six-month, 12-month, 24-month, and 36-month terms. Discounts for longer plan lengths are given and at the time of writing this review, are as follows: 10% off for quarterly payment, 20% off for semi-annual, 40% off for annual, and 50% off for biennial and triennial. Serveris customer support is handled via telephone and email during the local business hours of 8:00 a.m. – 5:00 p.m. and my email to support with a sales query was responded to within one hour. Serveris offers very affordable hosting plans from its servers in Lithuania. Most of the plans offered include unlimited bandwidth, domains, email mailboxes, and MySQL databases. Plans come with a free SSL certificate and a 14-day money-back guarantee. Wondering how Serveris stacks up against other Web Hosting companies? Enter any other Web Hosting company and we will give you a side-by-side comparison.